SlimQuick Extreme - Diet Pill Reviews: Does SlimQuick Extreme Really Work? 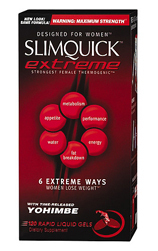 SlimQuick Extreme is known to be the strongest fat burning weight loss product for women. SlimQuick is designed to target physiological and hormonal barriers to help support and promote weight loss success. How Does SlimQuick Extreme Work? SlimQuick Extreme contains two types of Yohimbe, which work by blocking receptors in fat cells from storing added fat. Also, Yohimbe helps the body burn fat more efficiently. Consumers should experience the fat-burning benefits of Yohimbe for up to 8 hours, as it is a time-released substance. SlimQuick Extreme also contains pure Hoodia Gordonii, which alters brain chemicals in order to suppress consumers’ appetites. Also, Hoodia helps reduce cravings while making the body feel full. These four unique ingredients increase the body’s oxidation of fats while decreasing fatty acid synthesis. These ingredients help consumers lose weight by inhibiting the body’s ability to store fat. The rapid liquid gels claim to have a 200% faster release than standard caplets and capsules, providing consumers with immediate SlimQuick benefits. Consumers are also provided with a complimentary exercise program with easy to follow instructions and tips. Exercises are specifically intended for women, and focus on areas such as the gluteus, thighs, arms, and so forth. How Do I Take SlimQuick Extreme? Consumers should take SlimQuick Extreme before meals on an empty stomach. Doses can be taken every six hours; however, dieters should not take more than 6 supplements per day. Also, since SlimQuick Extreme will boost consumers’ energy levels, dieters should not take a supplement within 6 hours of bedtime. SlimQuick is available online, and costs approximately $60, although prices and discounts vary. To fully benefit from SlimQuick Extreme, consumers should also implement a diet and exercise program. Consumers are provided with a complimentary Weight Loss Program booklet for added support.